Before you buy that paintball gun, you should consider a number of factors to ensure your purchase is a success. I can’t even begin to list how many guns I have owned and sold due to weight issues. If a paintball gun is too heavy, forget it, you’ll realize the mistake you made and end up selling it, so before you ever purchase a paintball gun be sure you are aware of its weight. How do you decide whether a paintball gun is too heavy? Find out how much it weighs and carry a reference weight around for a bit, you should be able to decide after a couple ducks and snapshots. If you are going to buy a paintball gun, you might as well get one that is appropriate for what you will be playing. If you are going to play in the winter, you want one that will work decent in colder weather. If you plan on playing speedball you probably want a paintball gun that shoots 13bps or higher, and shoots at a consistent velocity. Whatever you need it for, chances are you’re going to want something that won’t break down constantly, so be sure to read reviews about it before you find your new gun in shambles because you couldn’t figure out what went wrong with it. The kind of features the marker comes with will give clue as to how well it will perform in conditions you will be playing in. Whether you will be holding your paintball gun for 5 minutes or 5 hours, if its uncomfortable or awkward to hold odds are you’ll end up hating it. 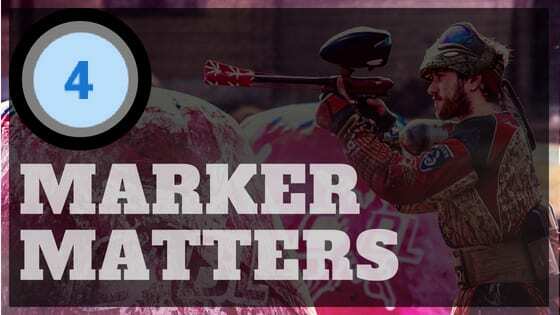 Go to your local paintball store and hold a couple of markers, if you like how the grip is designed on one marker, see if you can find a similar looking grip in another and see how it feels. You’ll find that the distances between the regulator and grip make some markers more comfortable to hold than others. Of course this is different for every player (to every man his own). This isn’t just an accounting term, its something you should consider before every purchase you make. Is this paintball gun something that will pay for itself over and over again through its dependability and quality? Will you have to buy upgrades to really get performance out of it? If so, how much will you have to spend? Is it something you’d use for woodsball and speedball? If buying one gun saves you from buying a backup marker then more power too you, you made a wise purchase decision. How long it will last is another question you should dig into before dropping bills. In many ways finding the right paintball gun is like finding a good girlfriend. You want one thats on the lighter side, performs well, feels good, and pays for itself over and over again.